Comments from Chris Leyland, True Potential Investments Deputy Chief Investment Officer. Yesterday, Greek voters went to the polls to vote as to whether to accept the rules of the Eurozone and their proposed austerity measures. The final vote came out as 61% against the creditor’s conditions and 39% in favour of acceptance. Greece’s governing Syriza party had campaigned for a ‘No’ vote, claiming that the creditor’s conditions were humiliating. Last night, the Greek Prime Minister said that the result does not mean Greece wishes to leave the Eurozone, more that it will allow Greece more bargaining power when it comes to negotiations with creditors. Last night, he also said “I’m convinced that the mandate is not to clash with Europe”. Unsurprisingly, European leaders have taken this badly and will hold talks today to determine what to do going forward. Greek banks are starting to run out of cash and current withdrawal limits of €60 a day could now drop down to €20 a day. The European Central Bank (ECB) must also decide what to do next, whether to increase, reduce or freeze the Emergency Liquidity Assistance it provides to Greece. As the ECB takes its guidance from the European leaders, it is unlikely that all assistance will be removed immediately. In respect of the widening impact of Greece on the stockmarket, the ECB could well start to step up its purchases of European sovereign bonds (quantitative easing) to help stabilise European markets and try to reduce the risk of contagion to other European nations. Unfortunately, the fundamental choices seem to be debt relief or Greece exiting the Euro. The latter is undoubtedly the more painful route and will cause most uncertainty for investors. We will continue to monitor what is happening with the Greek situation as we wait for more news from the Eurozone creditors as to how they intend to proceed. Short-term volatility will continue in markets as investors look for signs of stability and a way forward. The graph below illustrates the historical volatility of both the European and US markets. We can see spikes of volatility during 2011 and 2012, but it should be noted that they are only short-term and then the market returns to its historically lower levels. 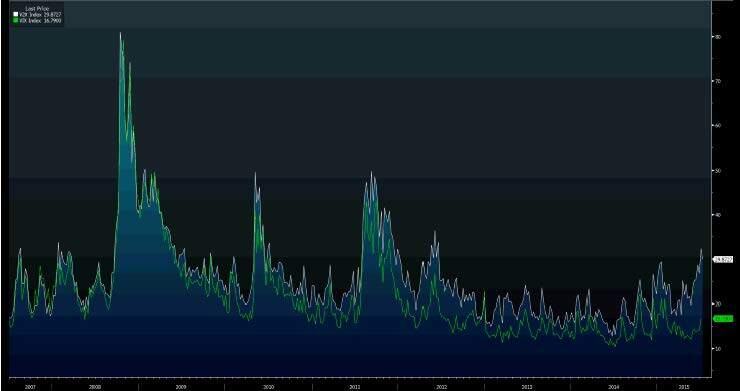 One other point to note is that, while markets feel very volatile at the moment, the levels of volatility we are currently experiencing are much lower than in 2011 and 2012. Although we have seen a pick-up in volatility in the US, this is far lower than Europe, illustrating exactly where the volatility lies. It should be noted, however, that volatility and falls in asset prices can provide favourable entry points to the markets for long-term investors. Although the renewed focus on Greece is currently the dominant driver, the issues are more widespread. Yield compression, high valuations in some stock markets and fundamental political differences are conspiring to overshadow the economic healing that has occurred since the dark days of the credit crisis. When we look back, we see that schisms open up buying opportunities for long-term investors. So, we view this uncertainty as a signal for investors to get off the sidelines and increase their portfolio holdings to maximise their future growth potential. For True Potential clients, this is fast and easy to do with our unique impulseSave® technology accessible directly from their client site.